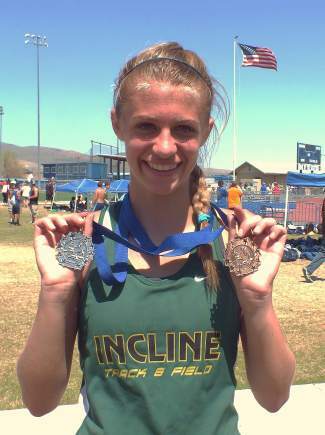 Incline sophomore sprinter Valeri Nix led the Incline track and field team at the Carson Invite with a couple of top-three finishes this past Saturday. Nix earned medals in both the 400-meter dash and the 100-meter hurdles, as she finished second in the 400 in a time of 63.50 and was third in the 100 hurdles in 16.61. She also placed eighth in the 100-meter dash, in 13.94, and was 11th in the 200, in 28.77. Freshman teammate Hannah Laurie finished 13th in the 800, posting a time of 2:42.97, and was 15th in the 1,600 (5:56.00) and 13th in the 100 hurdles (19.83). Fellow freshman Stephanie Homola was 14th in the 3,200, in 13:53.46, as well as 17th in the 1,600 (6:01.56) and 16th in the 800 (2:53.53). Also competing for the Incline girls were Kandace Dirga, who was 24th in the 100, 22nd in the 200 and 21st in the discus (57-03), and Arantza Alcantara, who was 33rd in the 100 and 29th in the 200. On the boys side, Incline freshman Ryan Eppolito finished 10th in the 1,600 in a time of 4:58.15. He was 19th in the 3,200, in 11:52.41, and 18th in the 800, in 2:15.48. Sophomore teammate Will Cory fared well in the sprint events, as he was 15th in the 100 with a time of 12.54 and 12th in the 400 with a time of 54.75. Blake Perry was 14th in the high jump, clearing 5-04.00, as well as 21st in the long jump with a leap of 14-03.00 and 32nd in the 100. Josh Lewis was 29th in the 200 and 20th in the 400. Freshman Conor Devine was 37th in the shot put.